If you are a Broadie, see this article instead. This procedure involves two main steps: creating a Google Billing Account, and adding the FireCloud Billing Account User to link it to FireCloud. 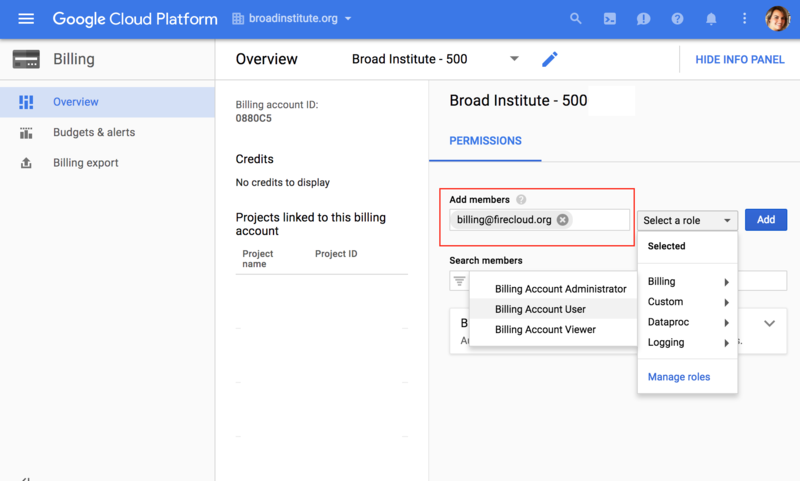 For anyone who's not a Broad affiliate, there are three different ways to create a Google Billing Account for use with FireCloud. Go to the Google Developers Console Billing page and click on Add billing account. You will need to provide billing information, but can start with a free trial that includes $300 in compute and storage credits. There are many resellers out there who provide additional billing options at no extra cost. Once you have created a Google Billing Account information, you should be able to access your account information by navigating to the Google Developers Console Billing page and clicking on Billing. The primary identifier of your account is the number below Billing Account ID. In order for FireCloud to recognize and charge your billing account, you must add [email protected] as a Billing Account User to your Google Billing Account. After you add the Billing Account User, you should be able to Create a new FireCloud Billing Project. Once you have created your FireCloud Billing Project, you can remove the FireCloud Billing Account User from your account by clicking on the trash can icon next to [email protected] on your billing account page. Please do not remove the Billing Account User until after you create a FireCloud Billing Project.